NEXT is proud to announce the introduction of its fully automated multiservice 'online-to-offline' (O2O) platform, including a modular vehicle solution and the supporting operating system required to bring an ecosystem of logistics services to market at scale. "To date NEXT has entirely focused on creating innovative solutions for the municipal mass transportation market. Today NEXT enters the global USD $2.3 trillion e-commerce market, which is driving a rapid transformation of the traditional retail supply chain," said Emmanuele Spera, CEO of NEXT. Built on NEXT's patented modular transportation platform, the logistics solution is an automated electric vehicle system that is designed to be customizable and scalable for a wide range of Mobility-as-a-Service (MaaS) applications. A fully integrated logistics solution, NEXT compliments warehouse optimization strategies, and workflow environments of 3PL providers, Retailers and Manufacturers. The unique modular platform seamlessly integrates with mixed fleets of autonomous mobile robots existing operating systems. 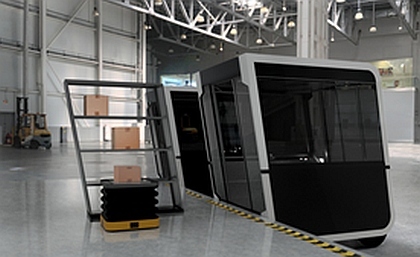 Upon completion of the automated warehouse loading process, individual vehicles autonomously connect to form a fleet, thus allowing the joint internal space to be utilized. While in route, parcels may autonomously shift amongst vehicles to ensure optimal final delivery. "NEXT's approach fundamentally differs from all current Autonomous Ground Vehicles or e-Shuttles in that our vehicle's open interior design layout can flexibly adapt to accommodate specific needs. Furthermore, NEXT's fleets may be operated by a human driver, a remote human operator, or autonomously. Therefore we plan to operate on public roadways in the near term," said Tommaso Gecchelin, CTO of NEXT. To meet the growing global market demands of future multi-mode transportation and business applications, NEXT is introducing the world's first Modular Mobile Parcel Locker. "Our unique locker solution will provide retailers with more control, while reducing the overall costs of delivery. The public will benefit from superior flexibility and ease of use as delivery locations are determined by customer proximity," said Sven Hackmann, EVP of NEXT. NEXT believes that the future of innovation is defined by co-innovation and co-ownership. Consequently, it is collaborating with several partners on various developments on a wide range of applications. With offices in Europe and the United States, NEXT has identified China and the Gulf region as its primary growth markets. "We are encouraged by the lifting of restrictions on the business scope of foreign startups, which is a path to ensure fair competition in China. From 2008 to 2015, China's same-city delivery was the fastest growing sector among various logistics businesses, with a 44% annual growth rate, according to China's State Post Bureau. It is expected the market will reach over RMB200 billion (USD$29 billion) in 2020, and we are excited to participate," said Spera. NEXT is preparing to announce its formal China market entry. NEXT Future Transportation is a mass transportation and goods movement startup that is developing a patented modular, autonomous, electric vehicle fleet and the supporting operating system required to bring the systems and services to market at scale. NEXT received seed funding from DP World, the world's largest owner-operator of marine and inland ports. https://bit.ly/2Nebhyh. NEXT is introducing the world's first Modular Mobile Parcel Locker.